I'm not really sure what to call the polearm that dominates the front portion of this painting of Christ before Caiaphas, although its size is massive and seems to border on fantasy-ish proportions. Note also the extremely long ahlspiess in the background. Source: As the watermark indicates, it's from Imareal, bild 000305. I would consider that large spear something of an exaggerated partizan or hunting spear. The picture is particularly noteworthy for having a couple of very nicely depicted scabbard rigs, plus the guy carrying the funky weapon is also wearing what appears to be leather or cloth covered armour. A nice find. Nobody including myself knew that 'fantasy' weapons existed since the Middle Ages. I wonder if the weapons shown in those manuscripts were used in real life back then...or not. A peculiar single-edged sword seen among the legions behind the Four Horseman of the Apocalypse, BNF Français 403 Apocalypse, circa 1250 AD. Another image that has been posted elsewhere, this two-handed sword seems like a strange form of falchion. 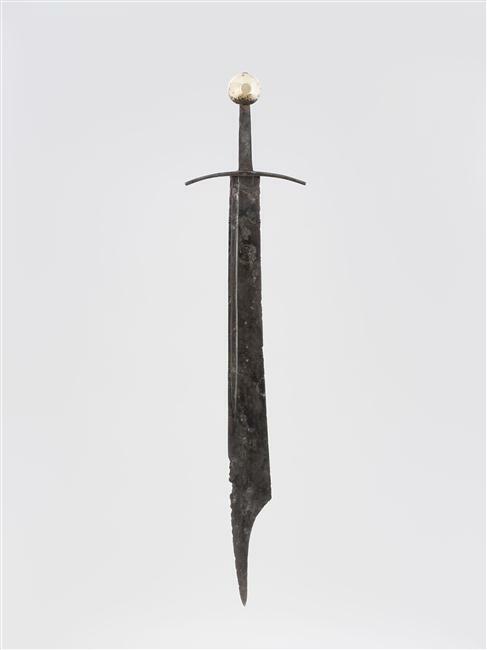 Coincidentally, I've seen one and two handed versions of this falchion-esque weapon being used in some footage from Battle of the Nations. .
David versus Goliath in the same manuscript. This looks to be exactly in the same guise as the "military cleavers" seen in the Morgan Bible. A few of the drawings you linked to on page #3 also have the same general characteristics of a long grip and a fairly short blade. I don't know why it's so hard for some to believe the Morgan Bible falchions existed. Weapons of that sort seem to have existed in China at a large scale. I wonder if part of the problem is our familiarity with mass production - we tend to think of a limited number of manufacturers and thus a limied variety of products. We tend to forget that such standards were limited, perhaps nonexistant in Medieval Europe. Thus, you are left with the reality of an unfathomable number of makers, each producing weapons, each of which are somehow unique. two real ones survive apparently - I've attached a photo of one in Paris. the "battle of nations" style repros are awful apparently - balanced completely wrong, the only thing that's close is the profile. Inlaid with 24kt gold... Wish I could justify something like that!